1. Make five slits down each side of each fish, and then place some garlic in each slit. 2. Put lime slices into the body cavity of each fish. Arrange fish in a roasting tin and drizzle over a little olive oil. Roast in the oven, (180º C, 350º F, Gas no 4 for about 20 minutes, or until the fish is cooked. 3. Meanwhile, to make the sauce, heat the oil in a pan and quickly brown the shallots and mushrooms. Stir in the flour and cook for a minute. 4. Gradually stir in the wine and tarragon. Bring to the boil, then stir in the cream and heat thoroughly, stirring, but do not allow to boil. 5. 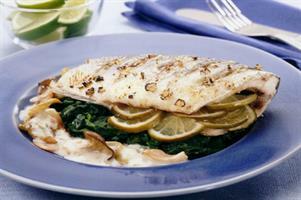 Serve sea bass with the oyster mushroom sauce. Garnish with lime and tarragon.